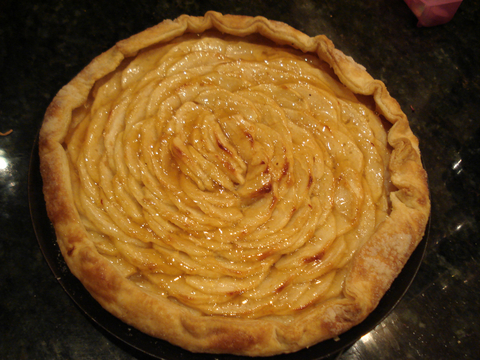 This apple galette was our New Year's Dessert. I made it with left-over pie dough from an elderberry pie I made on 10/10/10 for my friend Jason Menegus's birthday. I had enough left-over dough scraps and enough old apples from the Menegus' fall harvest to make a three-quarter recipe which is enough to serve as dessert for three nights. I was amazed how wonderfully these left-overs metamorphosed into a perfect galette. The apples on baking came back to life with a juicy and melting texture and just the right 'bite.' And the crust was tender, crisp, and even more flaky than the original due to layering the dough scraps. I would almost say I prefer the scraps to the original dough. Lesson here: NEVER throw out your dough scraps. Either turn them into cookies or freeze them for smaller pies, tarts, or free-form tarts (aka galettes). If I Could You Can!